Organizers are calling for a TIF redistribution, but a Logan Sqaure alderman says refund isn't likely. LOGAN SQUARE — With eight days left before Chicago Public Schools reopen, parents, teachers and allies of neighborhood schools are demanding upward of $100 million in Tax Increment Financing funds be poured into the school embattled district. 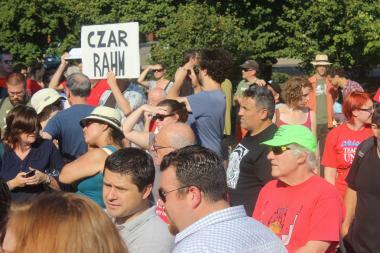 A crowd of about 200 gathered under the Logan Square monument Sunday afternoon, including Aldermen Bob Fioretti (2nd), Scott Waguespack (32nd), who represents part of Logan Sqaure, and State Representative Toni Berrios (D-Chicago). The demand is largely to fill a gap of about $162 million in total cuts to schools, organizers said — though CPS cites the amount as closer to $68 million — and TIF funds, which are amassed from property taxes that might otherwise be spent on education, should be used to fill that gap. According to opponents of school closings and budget cuts, there is currently about $1.7 billion in the TIF pot — about $1.5 billion of which is already earmarked for future projects. At least half of the amount leftover, about $100 million, should go toward school budgets that will otherwise leave classrooms devastated, said Cassie Creswell a parent at Goethe Elementary and member of Raise Your Hand, an organization that advocates for neighborhood schools. Last month, the mayor rejected a proposal to divert TIF funds to fund schools. "You cannot either tax your way or TIF your way out of this problem," said Emanuel, when asked about the proposal at a news conference following the council session. He said the surplus in TIF funds could be as little as $10 million, and would be a drop in the bucket in the face of the estimated $1 billion CPS budget deficit. Many of the protesters present were from nearby Kelvyn Park High School, which lost about $3.1 million — 5th citywide "in terms of cutbacks," said Alonso Zaragosa, a former community representative at the school. After Pilsen's Whittier Elementary School community center, La Casita, was demolished Saturday, Zaragosa said the demand for a TIF refund to schools is stronger than ever. The playground, soccer field and basketball courts that will replace it will be built with TIF funds, CPS said. La Casita's controversial destruction leaves the district with "161 schools without libraries," said Tim Meegan, whose recent Sun-Times opinion piece was mentioned several times by those at the event. "I used to think the administration of CPS was incompetent, but they're really intelligent," Meegan said, "What they're doing is privatizing our schools." Mayor Emanuel hasn't explored alternative funding for public schools, including a graduated income tax, Meegan said, and TIF funds are being used as tax shelters and investment opportunities by the city and business interests. Waguespack, a long-time critic of TIF and school closings, agreed with activists gathered on Sunday, but ultimately told those demanding a TIF refund not to hold their breath — even if TIF funds are released, he said, the amount won't be enough. "I know it may sound discouraging having an alderman saying that," he said. But, he noted, Emanuel already rejected a TIF redistribution to schools, despite attempts by the Progressive Reform Caucus of which he and Fioretti are members. "One day we're going to wake up and find the entire city has been privatized," he said. "They're building charter schools but they're not telling you about it." Organizers nonetheless repeated a call for parents to boycott standardized tests in their schools, which, Meegan said, are the means by which CPS deems students "failures" and advances school closings.